Students age 14-22 are invited to the Northwest Youth Leadership Summit on Saturday, October 22, 2016! 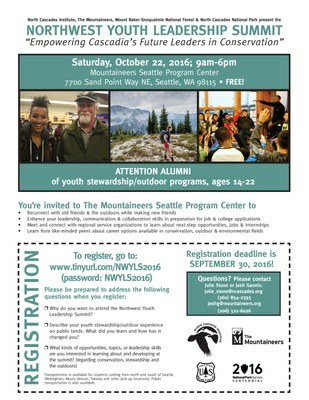 Calling all students ages 14-22 involved in youth stewardship, outdoor leadership, or environmental education programs in the PNW. You're invited to a FREE, fun, and inspiring event: The Northwest Youth Leadership Summit! 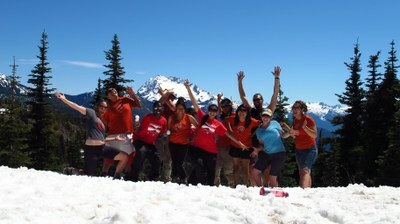 Hosted by The Mountaineers, North Cascades Institute, Mount Baker-Snoqualmie National Forest Service, and North Cascades National Park, the Northwest Youth Leadership Summit seeks to empower our region's Future Leaders in Conservation. 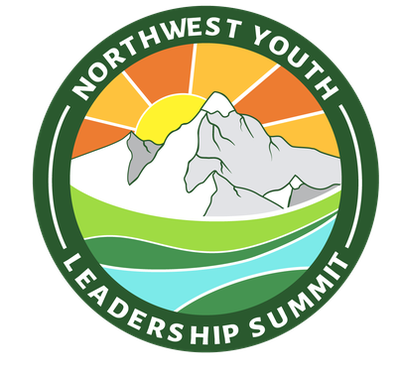 What is the NW youth Leadership Summit? At the Summit, we'll celebrate and inspire diverse youth leaders from our region. You'll receive leadership training and workforce development opportunities to help equip you to take action as a steward of your environment and community. Skill building sessions, presentations from student peers, outdoor adventures are all included. Plus, it'll be fun! You'll also have the opportunity to meet professionals from the National Park and Forest Services, Student Conservation Association, Washington Conservation Corps, and others about jobs, internships, and outdoor opportunities. The event also includes a light breakfast, lunch, raffle prizes, and lots of fun (just like in the photo below minus the mountain climb)! 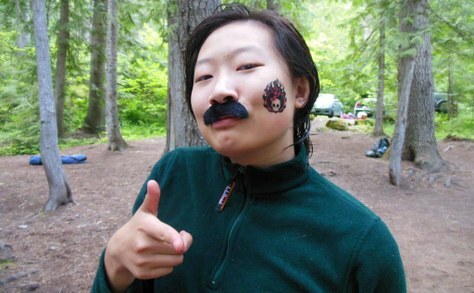 150-200 students ages 14-22 who have participated in environmental stewardship programs in the Pacific Northwest. You'll reconnect with old friends and make new ones. We'l also have adults from 30+ partner organizations involved in outdoor recreation, natural resource management, environmental education, and promoting equity and inclusion. Registration is open to alumni of youth stewardship or outdoor education programs in the PNW region. The registration deadline is October 7th! Did we mention that the event is free to students? Contact Josh Gannis, The Mountaineers Youth Education Manager at joshg@mountaineers.org. We're looking for volunteers and sponsors to help with this event! Contact andrianaf@moutnaineers.org if you can contribute to making this event even more memorable for these inspiring young leaders!